The hub is an opportunity for people caring for family and friends, and for those who depend on them, to meet and share their experience. We meet monthly on the 4th Friday of the month at Avonway Community Centre and new faces are always welcome. Why not drop in for a coffee, pick up information or talk to a social worker or representatives from the Princess Royal Trust for Carers, the New Forest Carer’s Friends and The Alzheimer’s Society. Carer and Hub supporter Bill Knight has been very busy including training as a Healthy Walks Leader. Finding local walks designed with carers and disabled people (sometimes with mobility aids) in mind, have got off to a great autumn start. They run each Wednesday at 11.00, starting and finishing at the Arch Clinic for tea and coffee. For general advice call Sara Winteridge on 01425 654426 or drop in to the next Carer hub. 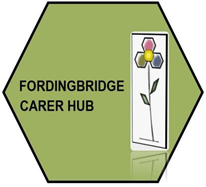 If you need help with transport 2 Bridges Neighbour Care group will try to help and can be reached on 0845 838 5902.